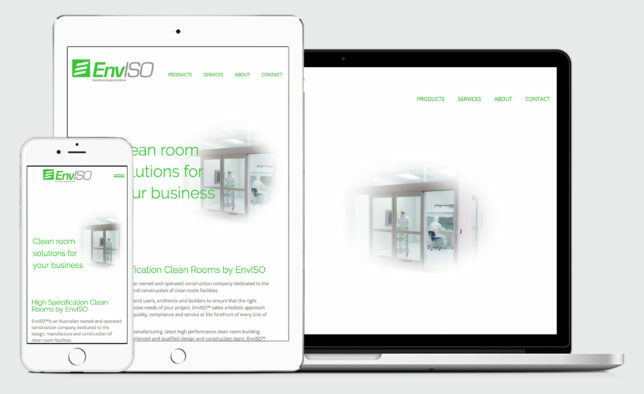 Check out our latest website for EnvISO clean rooms. How we undertook the new Enviso website project. Challenge: To create a website and brand identity that reflects the professional pristine clean nature of the clean room business. Many laboratories and bio-technology companies commonly work in sanitised environments. The new EnvISO website makes use of both, white-space and clean, crisp lines to emulate the nature of this industry. The sterile hygienic nature of these clean rooms are key to a supplier’s success, and within this industry, it is important that purchasers of these products know exactly what they are receiving with their EnvISO products. The website’s product page features interactive photos for each of their clean room products. This lends potential clients a clear idea of the structural elements of these clean room systems. We were able to put the company in touch with a branding contact, who designed EnvISO’s logos and corporate identity. We also helped put together a dedicated LinkedIn company page, to help to promote the business on other mediums. At Webtron, we’re here to help your business grow. Contact us to see how we can help your business today.